Geckos lick their eyes to clean them (because they can’t blink). Geckos are the only land animal in the world that can see colours at night. Geckos can climb anything because their toes have many tiny hairs which use molecular force. Geckos can detach their tails when threatened (and sometimes eat them!). Geckos shed their skin as they grow bigger (and sometimes eat it!). Geckos are the most vocal reptiles – they talk in clicks, barks, and chirps. Click here to listen. 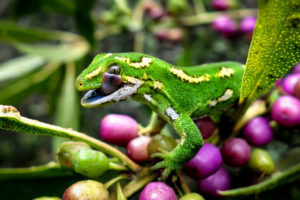 The is a New Zealand Jewelled Green Gecko cleaning its eyes. See more amazing gecko photos by Carey Knox. Learn to draw a gecko. Picture book about a day in the life of a gecko. A great book about gecko science.